As part of my MFA research thesis, I interviewed a dozen women memoir writers, and had enough overflow information to write several essays and articles, two of which appeared in Women Writing on Family: Tips on Writing, Teaching, and Publishing (Key Publishing House, 2012). 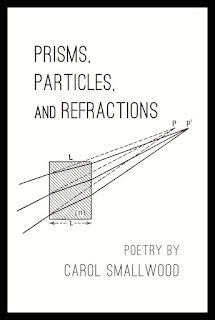 Carol Smallwood co-edited that book, has edited or co-edited several dozen other anthologies and collections, and has written six books of her own poetry. 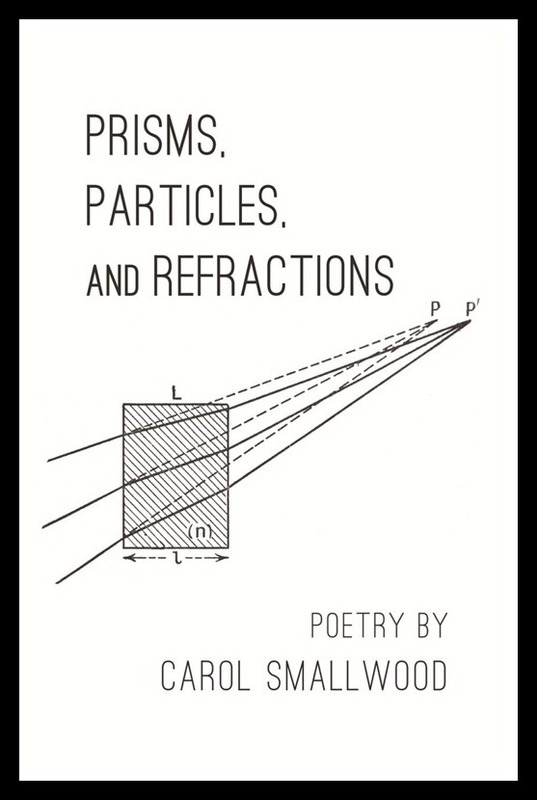 The latest is Prisms, Particles, and Refractions (Finishing Line Press). I read the galley the day of the solar eclipse, awaiting the sky to darken during a bright New Jersey afternoon, which felt right: the timing, the way the light was shifting in my office, what the poems have to say about light. Carol agreed to answer my nosy questions. LR: As is the case for many poetry books, many poems were first published in journals and websites, over several years. When / how in the course of writing single poems, and seeing some published, do you get a sense of what belongs together in a collection/book? CS: It is very fitting you asked questions about light on the long anticipated solar eclipse day! After several have been published, one gets an overview on what works and I can see a theme. The new collection I’m compiling now came about from one its poems being in the Thirteenth Annual International Ultra-Short Competition (sponsored by The Binnacle at The University of Maine at Machias: Honorable Mention Ultra-Short Edition 2016). The poem, “We Select” became the Prologue to A Matter of Selection dealing with making choices, selections. LR: In the Foreword, Lisa Zaran praises your book for "its vision and identification of darkness". Your Introduction says that your poems are "aimed at capturing some of the aspects of light—light that our eyes detect and light also as metaphor." Can you talk about the inspiration, opposites, and influences of light and dark on your writing? CS: Poetry with me begins with a clash, or what is called in creative writing classes: juxtaposition. And of course metaphor is vital also so the theme of light is one full of application. How we see has always fascinated me especially since taking a college class which examined rods and cones in vision. LR: One of my favorites is "Cuttlefish" because it asks a reader to consider things that aren't typically thought of together – fish, underwater darkness, light, bioluminescence, being able to change one's body. Can you comment on where this poem came from, and what you like about it as its author? CS: This poem was in my first chapbook to be published: On the Way to Wendy’s (Pudding House Publications, 2008). It came from watching a science program on PBS because how they managed to survive was so amazing. LR: As I read, I was continually reminded of how much depends on light or its lack, how emotions are tied to visual light cues: everything from lacework and its openings that let in light; the light between snow as it falls; the technical upside-down qualities of human vision; the sun, stars, black holes. I'm curious if light is something you have always observed? After writing so much about it, are you still seeing the world as light? Or does that keen focus wane after the themed poetry collection is complete? CS: You covered the light cues very well, Lisa. I’ve not even scratched the surface about understanding light and it continues to be something to wonder about; its implications with us are unending. My interest in light perhaps began with a professor having us write questions we wanted to know in a freshman psychology class. He really liked my light questions which reinforced my interest. LR: I wondered if "Live With It"—a poem about experiencing a seemingly permanent jagged black lightning bolt across the vision in one eye—was perhaps autobiographical and maybe a trigger for the light theme? Or am I just asking that awful question readers ask novelists about what parts of their fiction are "true"? CS: The jagged lightning did happen (fortunately only once) but it wasn’t the beginning of my collection on light. LR: When reading about light, one might expect to encounter gardens, the sun, the outdoors, space, etc. But other physical locations also repeat in several poems – the eye doctor's office, the library, Wendy's, the hospital, Nicolet City, the deep ocean. Intentional, or coincidence? What might a reader take away from those less expected settings? CS: Usually my inspiration comes not far from what I literally see which is a tiny amount of course—each of us has their own worlds, settings, from which we see. I didn’t start writing poetry until years after editing anthologies largely for librarians as I was afraid it was beyond me after literature classes in grad school on classics like John Milton. After retiring from public schools, I wrote a novel and feeling I had nothing to lose after that rough learning experience, tried poetry which was as if jumping off a cliff (had no idea if it was good or bad) and was amazed when I began getting journal acceptances. Writing poetry and editing at the same time provides a good balance for me. LR: There's an interesting mix of both free verse and formal poems, and some prose poetry. Is that how you write, alternating between forms? Do certain topics demand one specific form over another? Or is it the other way around: you want to write free verse, or you want to write something formal, and so then cast about for a story to tell in that particular way? CS: A few days ago I tried writing about Sirius, and The Big Dipper, as triolets and villanelles but what I wanted to convey wouldn’t fit the rhyme schemes so will have to try free verse or maybe a pantoum, sestina, cinquain, or others. What I saved trying to write them hopefully will be of use yet. Learn more about Carol by visiting her page at Poets & Writers, and browse her books here. Another interview with Carol is found over at Literary Mama. Image: courtesy Carol Smallwood. "Cuddlefish" reprinted with permission.